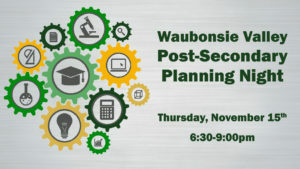 On Thursday, November 15th from 6:30-9:00pm, the Waubonsie Valley Counseling Department and friends will host the annual Post-Secondary Planning Night. Post-Secondary Night is open to students and families of all grade levels. This is great for upperclassmen looking to confirm their post high school direction or underclassmen who are just beginning the exploration process. The night will feature three forty-five minute rotations, so that families can learn about the topics most relevant to their student. A wide range of topics will be covered. A description of the available sessions* can be found below. We encourage all Warrior families to attend. What Makes a Great College- We’ve all seen the rankings, but what really makes one school better than another? Join us for a conversation about the factors that truly make a great college and perhaps more importantly, what makes a college a great fit for your student. College Essays That Work- Have you ever wondered what makes a college essay stand out to an admissions counselor? What experiences or topics are sure to grab attention? How can you make sure your personality comes through in your words? Hear from an experienced college admissions counselor on what really works in a college admissions essay. Other Factors in Admissions: Beyond the Transcript- Many colleges use holistic admission review processes that encompass factors beyond GPA, course rigor, and standardized test scores. Based on data from the National Association for College Admission Counseling and input from college admission representatives, learn more about the impact of other factors such as essays, recommendations, interviews, extracurricular involvement, and why, ultimately, your child is THE most crucial factor in the process. Applying to Highly Selective Schools- Ever wonder what it takes to get into Harvard, Yale, or Brown? We will discuss insights into the admissions and application process of America’s most selective post-secondary institutions. There will also be a question and answer session to address any specific questions or concerns. College Athletic Eligibility– Is your student interested in playing athletics in college? Do you know all of the requirements these students need to fulfill? If not, please attend our Eligibility Center presentation where we will go over all of the requirements outlined by the NCAA and NAIA. Standardized Testing & College Admissions- Illinois recently made the transition from the ACT to the SAT. What does this mean for your student and how can you help them prepare for success on the SAT? Come learn about the newly redesigned SAT and other standardized tests that may help your student strengthen their college applications. Success in the New Economy- In the new economy where a college degree no longer guarantees success, what other options do students have? In the right field, a two year degree/certificate holder can earn more than students with a traditional four year degree. Learn more about viable alternatives to the four year degree and post-secondary resources right in our backyard. Naviance- The Family Connection (powered by Naviance) is an online tool custom designed for Waubonsie Valley High School that students, parents and counselors can use together to determine the best path to college and ultimately a career. This interactive presentation dives further into the Naviance college and career portals available to your students in their post-secondary planning. Financial Aid Process- How do you pay for college? What’s the FAFSA and why do I have to fill it out? Come find answers to these questions and more. A financial aid counselor will help break down the cost of college, look at strategies for paying tuition, and discuss financial aid basics. STEM Careers- What are possible careers in STEM and what can you do now as a high school student in order to prepare for them? Join us for a session that provides an overview of potential career paths and explore coursework and experiences that will lead you to success after high school. College Night for Musicians- Members of the WVHS Music Department will discuss topics such as college music major options, audition processes, and careers in the field. We will also leave time for questions at the end of the session. Career Paths in Business- Many students want to work in a business field, but what business related major is right for you? Come hear from members of the business department as they share college and career advice to help navigate your path. *Sessions are subject to change.